From the moment he opened his mouth Thursday at a gubernatorial forum on women's issues, Lt. Gov. 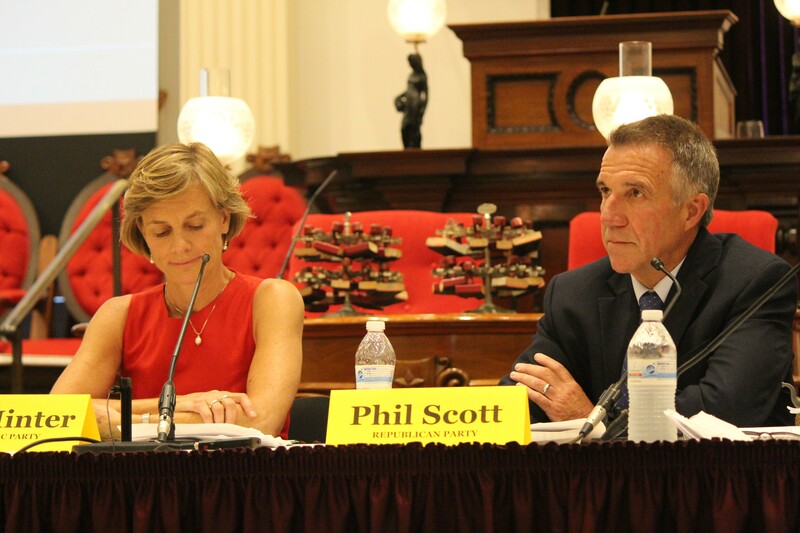 Phil Scott tried to make one thing clear: He's not your average Republican. "Despite what you'll hear from my opponent's party and my opponents at large, I'm pro-choice. I support marriage equality. And I support equal pay for equal work," the GOP nominee said. But despite his best efforts, Scott was at an obvious disadvantage throughout the Statehouse forum, which was sponsored by the Vermont Commission on Women, the League of Women Voters, and Business and Professional Women/Vermont. Put simply, his Democratic rival, former transportation secretary Sue Minter, had a bit more experience with the subjects at hand. "Like a majority of Vermont women, I've lived this," she said, referring to the gap in wages between men and women. "I've worked hard — probably harder than many of my male counterparts — and known that I was probably earning less." When the candidates were asked whether they would guarantee paid family and medical leave to all Vermonters, Minter again turned to her personal experience. "Vermonters should not have to choose between their work, their child or people they love in need," she said. "When I was pregnant with my first child, Ariel, I was in a new job. I was afraid to tell them about my pregnancy. And I had no security of whether I would have a job to get back to." Minter was quick to note that her Republican rival had opposed legislation, signed into law last winter, that provided paid sick leave to some Vermonters. At the time, Scott called the timing of the bill's passage "unfortunate" and said he would have preferred more exemptions for small businesses. But at Thursday's forum, Scott sounded more amenable to the law, saying that the legislature had taken "great steps towards providing paid leave for employees." "I would not support any steps to reverse this, but businesses do need time to adjust and absorb these new costs," he said. "So I would not support an expansion of these mandates so soon." When the forum's moderator, VTDigger.org founder Anne Galloway, brought the subject back to reproductive health care, Scott again argued that he would not curtail abortion rights. "I fully support a woman's right to choose and to have access to quality care," he said. "I may also be one of the only Republicans in the country to have spoken up against the calls to defund Planned Parenthood when that debate was going on in Washington not too long ago." That didn't keep Minter from tying Scott to his party. "Let's just face it: Republicans across this country right now are waging a war on women," she said. "Now, listen, I know Phil says he's pro-choice. But he has been recommended by the Vermont Right to Life Committee. He has supported restrictions that would reduce a woman's right to choose in the state of Vermont. We cannot let Vermont go backwards, and under my leadership it will not." It is true that the VRLC expressed support for Scott during his primary-election contest with retired Wall Street banker Bruce Lisman. 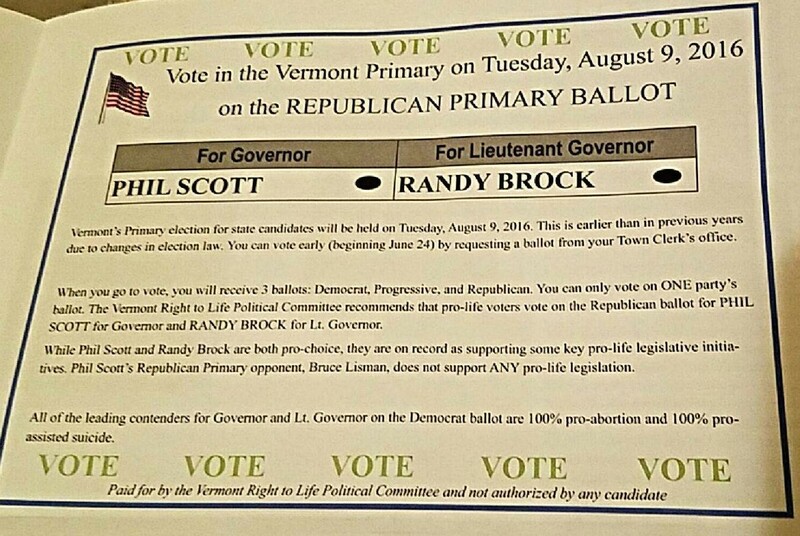 The organization sent a mailer to its members over the summer calling on them to back Scott and Republican lieutenant gubernatorial candidate Randy Brock. "While Phil Scott and Randy Brock are both pro-choice, they are on record as supporting some key pro-life legislative initiatives," the mailer read. "Phil Scott's Republican Primary opponent, Bruce Lisman, does not support ANY pro-life legislation." It continued: "All of the leading contenders for Governor and Lt. Governor on the Democratic ballot are 100% pro-abortion and 100% pro-assisted suicide." Scott and Minter weren't the only ones at the table Thursday. 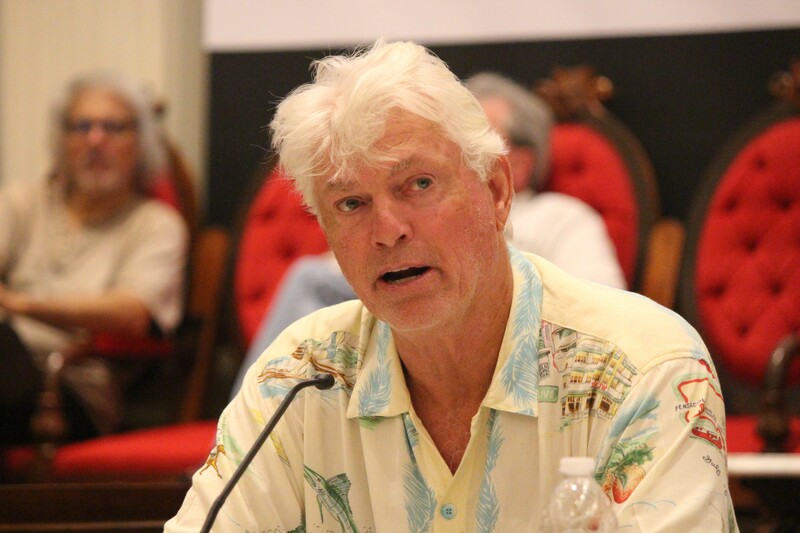 A third candidate, Liberty Union nominee Bill "Spaceman" Lee, sauntered into the Vermont House chamber eight minutes after the forum was scheduled to begin, wearing a Hawaiian shirt and jeans. Throughout the event — his first this election season — the former Boston Red Sox and Montreal Expos pitcher broke up the policy debate with off-topic observations and off-color remarks. 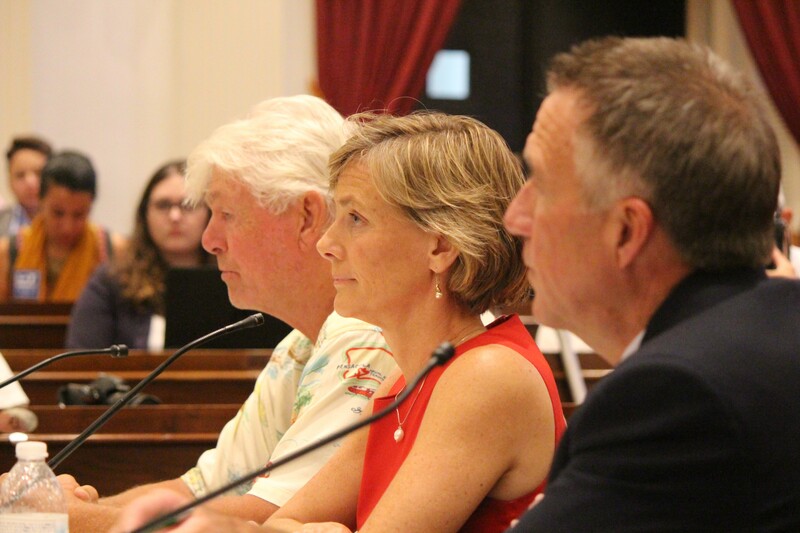 During her answer to Galloway's question about reproductive health, Minter mentioned that a new Vermont law mandated insurance companies to cover vasectomies. "I got one of them," Lee interjected, prompting laughter from the crowd. "Yeah, but I have reversal, too, and I got a daughter out of it." Since he won the Republican primary last month, Scott has insisted that Lee be invited to most gubernatorial debates. But Lee said Thursday that he wasn't in league with the lieutenant governor. "I'm not out here to take away Sue's votes. I'm out here after Phil's votes," Lee said, trailing off into uncharted territory. "I'm a gun toter. My mother's name is Hunt. All the Hunts live in southern Vermont. And what do we do? We hunt. And so, yeah, I'm not afraid of killing things and, you know, putting meat on the table. I eat roadkill. I'm about as conservative as they come." Asked how he would address racial bias if elected governor, Lee provided an unusual answer. "I do racial profile," he said. "If I'm in the Kingdom and I see a black guy in a vehicle, I find out — when he stops, I go up and the first thing I ask him is, 'Are you over 35?' And then I ask, 'What position do you play?' Because I still play baseball. In other words, I ask questions. I go out there." Scott Fights Abortion Attack, But Is He Playing Into Democrats' Hands?